Dr. Dennis Askew (foreground) conducts a master class session with Northern Illinois University tuba student Kurt Bonamer. On Feb. 17th, UNCG and Internet2 hosted an Internet2 Day at UNCG. Internet2 is a high-speed advanced network linking universities, industry, government and other research/creative entities. Beyond the network itself, it offers special interest groups and subject-area focused programs, including Arts & Humanities, Health Sciences and Science & Engineering. 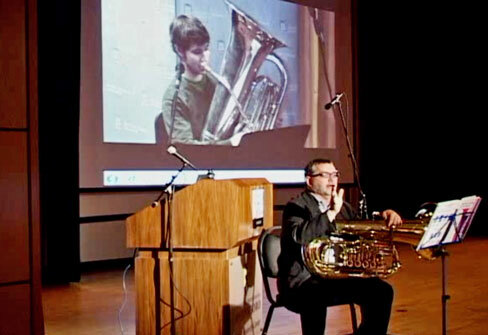 The event included a live demonstration of remote musical interaction conducted by UNCG School of Music, Theatre and Dance tuba professor Dr. Dennis Askew who provided remote master class instruction to Northern Illinois University (NIU) School of Music tuba student Kurt Bonamer. This was the first time the Digital Video Transport System (DVTS) technology had been used for a musical demonstration or performance at UNCG. By enabling students and faculty to teleconference without the typical delay, this technology opens UNCG to the opportunity of musical instruction across the globe. The foundation for the musical collaboration was established in October 2011 when UNCG violin professor Marjorie Bagley performed a ground-breaking live duet with Cellist Cheng-Hou Lee of NIU. Though 700 miles apart, they performed together as if sharing the same stage. Outside of rehearsals, this was the first time that LOLA (Low Latency Audio Visual Streaming System) software had been used to enable a remote live musical performance in the U.S.
a demonstration in which Dr. Steve Danford, UNCG Physics & Astronomy associate professor, and Dr. Aaron LaCluyze, of the Department of Physics & Astronomy at UNC Chapel Hill, remotely controlled Skynet Prompt Telescopes located more than 4,000 miles away in Chile. The event was co-sponsored by Internet2, the UNCG Office of Research & Economic Development, and Information Technology Services (ITS). Technical staff from ITS; the UNCG School of Music, Theater and Dance; NIU School of Music; Elliott University Center; and the Faculty Teaching & Learning Center collaborated to make the day possible.